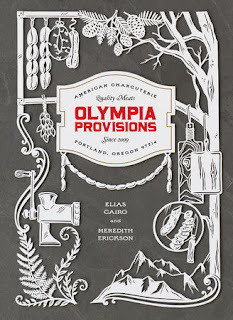 Olympia Provisions is an American charcuterie cookbook. Charcuterie is the process of preserving meat for a longer shelf life. The method of preserving meats began long ago in an effort to keep meat from going bad. This craft is now making a comeback into the hearts of people that really care about meat making; people like Michelle Cairo, Elias Cairo (brother and sister) and co-owner Tyler Gaston. Together they own Olympia Provisions; a fast growing charcuterie business as well as two restaurants, that are located in Portland, Oregon. Elias is the lead salumist, a salami making expert and you can feel the love and excitement about his craft throughout the book. There are step by step instructions, starting off with simple instructions to the very detailed. 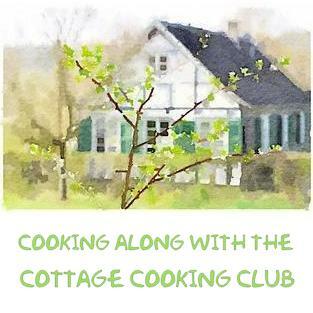 This is the kind of a cookbook that one would collect, full of personal stories, history, technique and fun with amazing photography. My husband Don, is the one who first got excited about this book. It’s all about charcuterie, a process of curing meats, something that he has always dreamed about. He even received a sausage grinder for Christmas to start making his own in anticipation. Don followed the recipe exactly for the breakfast sausage, but did not use fatback so our patties were very lean. He made them into patties instead of stuffing them into casings. 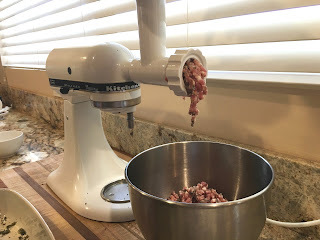 I can see him going crazy at this new “hobby”, especially while we are in Oregon for the summer as we has access to so many fresh meats and spices. Thanks tandy, Happy New Year to you!!! Gotta get that cookbook . Happy Nrw Year to you and your family . Hope you enjoy it Nee, Happy New Year's to you and yours as well! I'm so excited, I'm going to get this for my daughter and her new husband, they're into all that kind of stuff, they just cured their own Christmas ham! 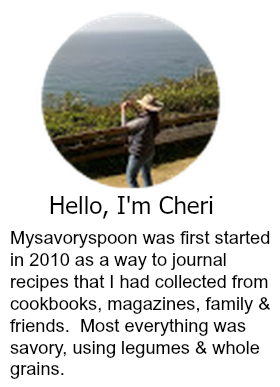 Happy New Year Cheri! Hi Sue, very impressive, their own ham. Sounds like your family is getting bigger, such a wonderful thing, happy New Year's! I love my KitchenAid meat grinder. This sounds like a good resource - might need to hop over to Amazon and click "add to cart!" Hi David, apparently Don loves his too, Happy Holidays! Even though I don't eat much meat, your husband's patties look pretty tempting! Thanks Kim, I don't either but someone else certainly does. Thanks Kim, you too Happy New Year! I know it seems like people are trying to learn the old techniques. Though charcuterie sounds pretty complicated. Happy New Year's Charlie! What a wonderful book! Have a lovely New Year! Homemade charcuterie is becoming very popular. I can see a lot of good eating in the near future thanks to that book. :) Wishing you all the best in this new year. Thanks Karen, yes alot of different foods and seeds are becoming that way. Happy New Year's to you and your family! Hi Helen, yes, he certainly seems to be having a great time with his sausage maker, though it does seem to be quite messy if you get my drift. What a fun and delicious hobby to get into! Thanks Chris, it is a lot more involved than I first thought, but very satisfying. What a cool and fun project - I bet it is delicious! Thanks Tricia, we are learning, it is a very precise craft.